Stonedge at Troon North townhouse is located in the prestigious Troon North golf community in North Scottsdale. This luxury townhouse is nestled along the fairways of the Monument course. and is within short walking distance of the premier Troon North Golf Club club house. Enjoy local shopping, dining, hiking and golf or take a short drive to DC Ranch. Private expansive outdoor space on three levels with incredible views. Community pool and spa. 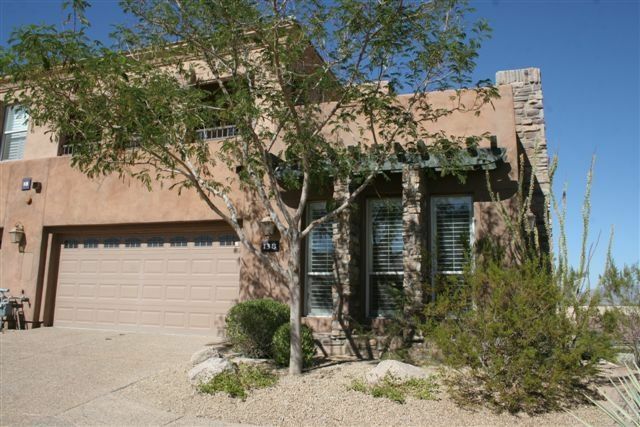 The townhome is at one of the highest elevation points in Troon North with stunning views in all directions, of Pinnacle Peak, Troon North Golf Course, the Phoenix valley & breathtaking boulders. Soaring ceilings with plenty of windows for tons of light. Huge gourmet kitchen w/granite counters & maple cabinets, 2 master suites 1 up, 1 down, plus large loft with pull out couch.Close to pool, walking distance to club. 2 indoor fireplaces and one outdoor fireplace with a gas grill and private patio for dining outdoors. This was a great experience for the entire family. The condo was just as advertised. Anthony was great at checking in to see if we needed anything. Great location. Very clean and open. We definitely stay again. Great stay at a beautiful and spacious condo. Loved all the different deck areas to enjoy the incredible views of Scottsdale, Pinnacle Peak and beyond. Bed was very comfortable as was the sectional in the t.v.area. Nice to be close to Troon North clubhouse and grille, hiking trails and golf. Would definitely rent again. Nice home divided into a series of cozy levels. Very good location in Troon vicinity within a gated community. Owner is accessible and straight forward. In summary, a good experience. We enjoyed our stay. The home is gorgeous, clean, spacious and in a great location. We loved watching the sunsets and were thankful to bring our pups along. Thank you for a great stay! The townhouse could not have been nicer, and is very well maintained. The unit is at the top of the complex which gives you great views of the valley. The owner was very helpful. I texted with a couple questions and he either texted or called back within a few minutes with the information we needed. Our only issue with the unit is its location to the pool which requires going up and down a long hill. Since there was no parking by the pool, I drove my wife down and pick her when she was done. If you're looking to get out of busy Scottsdale to stay in a quieter desert spot Troon North is a great alternative. Less than 20 minutes to at least a dozen hiking trailheads. Similar distances to Old Town Scottsdale or Cave Creek area. Under 2 hours to Sedona which is a great day trip. Regarding the property, first of all , Anthony's unit is HUGE. Much bigger than expected. There are three floor and each one has an outside deck/sitting areas. The property is up a hill and one of the higher spots so views are great to the front and back.. Main floor has the master bedroom and bath and full kitchen/dining room which was convenient. Communications were excellent. Had one hiccup with gate code but solved promptly with one phone call. There was just two of us staying at the property but would be ideal for 2 couples as there is plenty of room. Cost for two people was more than reasonable but for 4 would be an amazing value. Definitely would consider staying at this property again if visiting the area and recommend to others. Located in the Troon North area of North Scottsdale behind the troon North Golf Clubhouse.